Political experts say North Korea has used the Pyeongchang Olympics to drive a wedge between South Korea and its ally, the US and to potentially ease pressure on its sanctions-crippled state. 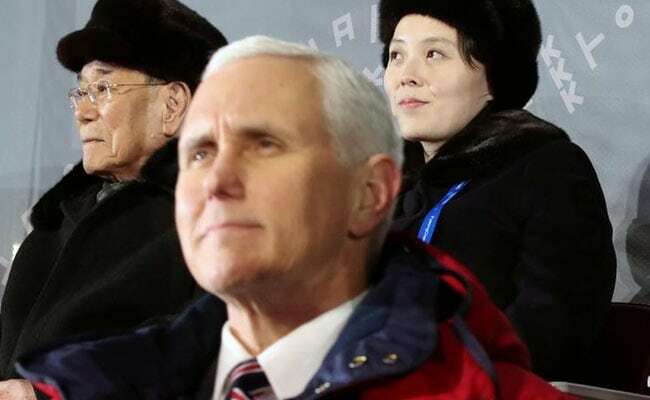 Mike Pence attended the Winter Olympics, seated next to Kim Jong Un's younger sister, Kim Yo Jong. Pyeongchang: North Korea has emerged as the early favourite to grab one of the Winter Olympics' most important medals: the diplomatic gold. That is the assessment of a former South Korean government minister and political experts who say the North has used the Games to drive a wedge between South Korea and its ally, the US and to potentially ease pressure on its sanctions-crippled state. "North Korea clearly appears to be winning the gold," said Kim Sung-han, who served as Korea's vice foreign minister in 2012-2013 and who now teaches at Seoul's Korea University. "Its delegation and athletes are getting all the spotlight, and Kim Jong Un's sister is showing elegant smiles before the South Korean public and the world. Even for a moment, it appears to be a normal state." US Vice President Mike Pence, who attended Friday's opening ceremony along with the North Koreans, said "no daylight" existed between the United States, South Korea and Japan on the need to isolate North Korea. A US official, speaking on condition of anonymity, said more important would be how Pyongyang behaved after the Olympics. It had shown no interest so far in negotiating over demands to give up its nuclear and missile programs. Pence cast one of the loneliest figures at the opening event. He remained seated when the joint Korean team entered the stadium, in contrast to Moon who stood along with Kim Jong Un's younger sister, Kim Yo Jong, to applaud. Douglas Paal, a former senior US diplomat under previous Republican administrations, said North Korea held the propaganda edge for now because, "it's tough not to get caught up in the emotions of an Olympics event". But he said it would be hard for Moon to keep up the momentum after conservatives at home and allies abroad remind him of what is at stake in the North Korean nuclear threat. 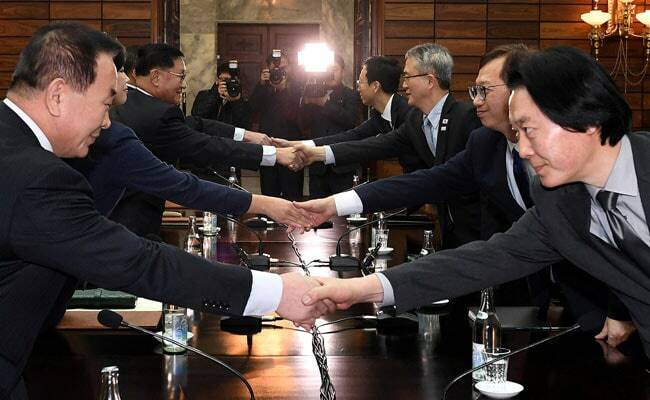 The warm North-South body language at the Games not only fanned talk of a split between Seoul and Washington, it contrasted with a cold encounter between South Korea and Japan, an ally in U.S.-led efforts to pressure North Korea. Japanese Prime Minister Shinzo Abe, who looked uncomfortable at times during the opening ceremony, irritated his hosts by telling the South Korean leader that joint South Korea-US military drills should be promptly resumed after the Games. To pave the way for the North's participation at Pyeongchang, South Korea had delayed the annual exercises with US forces, which usually take place between February and March, until after the Olympics. "Now is not the time to postpone US-South Korea military exercises," Abe said, according to South's presidential Blue House. 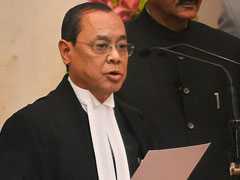 Moon replied that it was not appropriate for Abe to have raised the issue, describing it as an internal affair. Japan does not participate in the military exercises, but it is within reach of North Korean missiles and relies heavily on US forces and their readiness to deal with that threat. "For Japan it's a nightmare scenario," said Takashi Kawakami, a professor of international politics at Takushoku University in Tokyo. "North Korea is skilfully driving a wedge between the US, Japan and South Korea." A senior Japanese defence official said North Korea's Games charm offensive could "simply be a way to gain time" until it completed its nuclear and ballistic missile development. But in an interview in the Washington Post on Sunday, Pence said he and Moon had agreed on terms for more diplomatic engagement with North Korea, first with Seoul and then possibly leading to direct talks with Washington without pre-conditions. "No pressure comes off until they are actually doing something that the alliance believes represents a meaningful step toward denuclearization," Pence was quoted as saying. "But if you want to talk, we'll talk," he added. North Korea is under a heavy UN sanctions regime which was originally targeted at stopping the proliferation of arms and nuclear and missile technologies, but has become more all-encompassing after its accelerated missile testing. After years of ineffective implementation, those sanctions may have begun to finally bite, which, according to a Japanese government official and experts, helps explain why Kim Jong Un agreed to send a national team and his sister to the Olympics. A foreign resident living in the North Korean capital, Pyongyang, told Reuters he had seen fewer people in restaurants and luxury goods in shops in recent months. Fuel prices have risen and more wood-fired Soviet-era trucks have been seen on the outskirts of the capital, said the resident, speaking on condition of anonymity. Seafood, once a major North Korean export, was now more widely available at home after UN sanctions banned these exports in August. When a ferry carrying North Koreans to the Games docked in South Korea last week, the North asked its hosts for the fuel needed to get it home, Seoul's Unification Ministry said. The North then dropped its request after it asked for more fuel than Seoul was willing to provide, a Seoul official added.